May 1, 2018, 2:39 PM · In an effort to promote the coverage of live violin performance, Violinist.com each week presents links to reviews of notable concerts and recitals around the world. 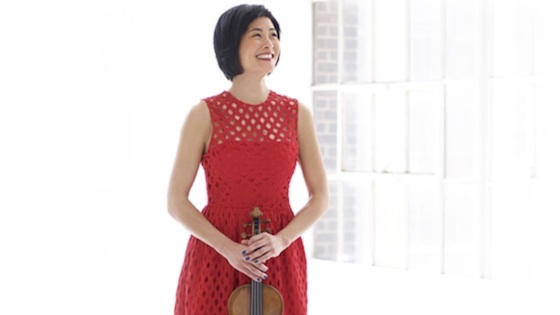 Jennifer Koh performed the first installment of "Shared Madness," the West Coast premiere of 32 solo pieces. Los Angeles Times: " Without flamboyance, she reveals a capacious range of expressive possibilities. Some know her for her Bach, Beethoven, Sibelius and Tchaikovsky. Others think of her and Bartók. Yet her dedication to new music, second to none among stellar soloists, is all over the map....Hence 'Shared Madness' is a sharing of Koh's vastness. " Vadim Gluzman performed the Brahms Violin Concerto with the Boston Symphony Orchestra. The Boston Musical Intelligencer: "I appreciated his mastery of dynamic control, clean intonation, and fine embrace of rubato, resulting in a true romantic’s interpretation." Boston Globe: "Gluzman’s account was firmly profiled, tonally generous if less coloristically distinctive, and interpretively right down the middle." Paul Huang performed in recital with pianist Orion Weiss for Washington Performing Arts. Washington Post: "(Huang) upends the cliche about young virtuosos who excel most at fire and flash: He certainly has both in abundance, but his signature, on this recital, was an ability to play at the edge of audibility, carrying the sound down almost to nothing." Patricia Kopatchinskaja led Mozart’s Symphony No. 40 as concertmaster with the St. Paul Chamber Orchestra. Minneapolis StarTribune: "More a psychological deconstruction than an interpretation, Kopatchinskaja took startling liberties with the piece. Loud and soft passages were violently contrasted with sudden, lurching alterations of tempo that might have made Mozart choke. It just about worked. What emerged was a demonic view of Mozart — think “Don Giovanni” with an extra shot of adrenaline — that fired with creativity but teetered on the brink of desperation. The effect occasionally verged on the brutal. But it was also devilishly, rivetingly exciting." Christian Tetzlaff performed the Jörg Widmann Violin Concerto with the St. Louis Symphony Orchestra. St. Louis Post-Dispatch: "Composed in one long movement, it owes a lot to the music of Alban Berg in its dissonance and overall feel; there are fragmentary moments of beauty along the way, but it’s a passage through a mostly painful world. The only time the violinist’s bow paused was in a moment of musical agony when he seemed to give up, slumped over like a marionette whose strings have gone slack, before snapping back and returning to a state of frenzy. All concerned rose to the considerable technical challenges of this searing work. It wasn’t an easy listen, but it was gripping and memorable." Benjamin Beilman performed Mozart Violin Concerto No. 3 with the Long Beach Symphony. Violinist.com: "Beilman seemed most at ease and in his element during the buoyant third movement, during which the charm and elegance of music and musician seemed to meld into one happy character."